A pastiche, a myriad, a mosaic. A panoply of ideation and concept. As a gift from me to you, you aural sects. I’m most excited about my first LIONEL MEDIA video interview with one of my heroes, Pat Cooper: a comedian whose natural abilities are nonpareil. He unloads and unleashes on everything and everybody. It is classic. In this sampler serving, a discussion of virtually everything in a style and packaged delivery system that is sui generis. Spoken word meets audio blog meets Lionel unplugged, unfettered, unfiltered, uninterrupted and unapologetic. Plecia nearctica, or as every Floridan knows them as, the love bug. The joke was they flew united. (Kids, ask your parents.) State officials let these pesky windshield terrorists get out of hand. (Honestly, I always thought it was a car wash industry conspiracy.) Well, that’s the way the feds view the Internet. It got out of control and now they’ve got to find new ways to reel it in short of just shutting it down. And believe me, they’re working on that too. China’s showing us how. Ladies and gentlemen, I give you Four Loko. An apparent scourge on our youth, a witches brew of alcohol and caffeine. (Can you say Irish coffee?) And as such, folks want it banned in an almost Pavlovian reflex to everything. I dedicated a PIX 11 commentary to the subject that you may watch here. And with that a bit of a discussion on the duties of news and narrowcasting. It’s a recent subject of fascination of mine. My wife and I watched this incredible documentary that I heartily recommend to you. It showcases three days of testimony in 1971 of Vietnam combat vets and their horrific and horrid tales of war. War that we assigned them to commit. War that we trained them to be most proficient at. It’s relevance and poignancy today are hard to miss. Herein, my thoughts. Please. Buy this. Tiffany’s Table Manners for Teenagers. And you read it. 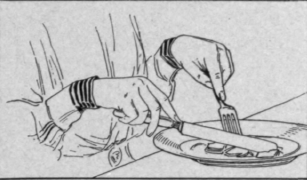 If only there were words that existed that could somehow allow me to explicate or limn the deep-seated visceral contempt I have for bad cutlery technique and table manners. Along with that I speak to a number of issues: (1) rising incivility; (2) health and my fascination with contemporary medical procedures; (3) how we perceive our own mortality; (4) the loss of wit and the ability to identify and appreciate the sardonic; and (5) a personal dream I have for this country. Herein please find my latest thoughts and musings anent a panoply of topics so broad and varied, even I’m impressed. With me.